This article is a guest post by Harman Kardon from SGTReport.com. The author questions a lot of recent developments initiated by the US government which leave US citizens very worried about key subjects like privacy and liberty. As the latest and greatest scandal, act of tyranny, unfolds before the United States citizenry, we have to look back and ask why. Why would the government need to collect every stroke of the keyboard, every phone call made and every website visited? If the government isn’t out of control and attempting something that’s very sinister in nature, then why would this information be necessary? What is the point of collecting all this information on each and every citizen? I understand the NFL pre-season is about to begin and most folks really can’t be bothered with such trivial questions of politics and liberty, but what if the NFL was deemed too violent to be broadcast into your living room and you could only enjoy a game at centralized locations with the other people that wanted to watch a game? This question merely opens the door to a whole host of other questions. If the government is not attempting to control every aspect of our lives then why would cameras need to be mounted at most of the major intersections on our roadways? What is the purpose of collecting photos of vehicles that are passing through this intersection or that intersection? Who is monitoring these cameras? What are they doing with the information? Why is it important? You probably passed several this morning on your way to work and didn’t really notice as they have become part of the landscape. Over the past two decades we have seen more and more cameras popping up in locations that seem very benign on the surface. These cameras can pop-up at will and in any location the police deem necessary. This is, of course, done under the false guise of “protecting the citizenry from terrorism”. You are more likely to be killed by lightening or an auto accident than you are by an act of terrorism. I personally knew several people that are no longer living that were killed in auto accidents. I do not know one person whose life has been affected by terrorism, much less ended. Yes, the disgusting acts of 9/11, the Atlanta Olympics, the Boston Marathon and Oklahoma City were very tragic and I am sorry for the families that lost loved ones in these crimes. The question is did it affect your life directly? Did any of these criminal acts, especially in light of the current scandals, ever leave you wanting or questioning exactly how these criminal acts could have manifested? Would another camera have helped in any of these situations? Do you have a camera built into your phone? What about a microphone for use hands-free? I have often wondered why a phone would all the sudden become, not only a phone, but a camera. It always seemed a little odd, but now we know. According the reports that are coming out, the camera in your phone has played a very integral part in information gathering. Now, not only has the government been listening to and recording your conversations, they have been watching where these calls have originated. Why is that important? No, I do not have anything to hide, however, I do have my privacy to protect that is guaranteed under the 4th Amendment of the Constitution. I do have conversations that are private. I would like to believe that where I go, what I discuss with another person and the scenery I am enjoying is between me, the person involved in the conversation and our Creator. Alas, that is not the case and apparently has not been the case for almost three decades! Main Core was developed and implemented in the 1980’s and is the backbone of the new PRISM information gathering nightmare. This brings up another question. Why is the federal government buying so many hollow-point bullets and fully-automatic assault rifles? Over the course of the past eighteen months the Department of Homeland Security (DHS) has ordered roughly 2 billion rounds of hollow-point bullets. For what purpose? The DHS is an agency that was put into place to combat “terrorism”. The DHS is supposed to be protecting the citizenry of the United States. The volume of ammunition that has been ordered is the equivalent of arming the United States Armed Services for a 35 year war! When the Boston Bombing occurred the city of Boston enacted Martial Law; it was not called Martial Law. 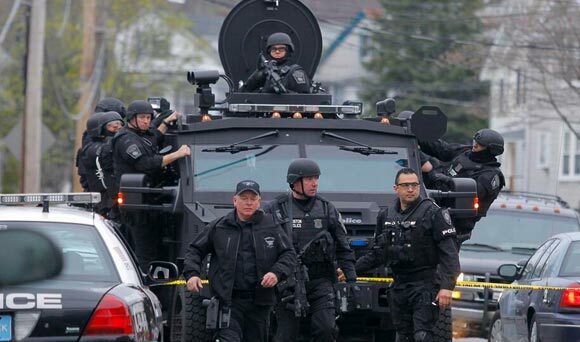 The Governor, Deval Patrick, declared (another word for “ordered”) the citizens of Watertown, Waltham, Newton, Belmont, Cambridge and Allston Brighton to “shelter-in-place” (another word for martial law) and proceeded to call in the militarized police. The “police” began going door-to-door conducting warrantless searches of private citizens property. The “police” began removing people from their homes. This was unprecedented in the United States. Was “shelter-in-place” declared after 911? Was a militarized police force sent in to conduct warrantless searches? Were any of the same tyrannical tactics used in Boston enacted in the city of New York following our country coming under direct attack from a foreign enemy? Yes, we know more today regarding “terrorism” than we did in 2001. Yes, we have a better understanding that the United States is no longer immune from “terrorist” attacks. However, what was our response to the 911 attacks, regarding the CITIZENS of the United States? Were we immediately all considered to be a suspect? Were we, the citizens, subjected to “suspicion” of being the terrorist? Was the military going door-to-door and ordering people out of their homes and conducting searches? Remember we were told this was an attack by a foreign enemy. What happened on 911 was coming at us, you and me, at break-neck speed. We did not have time to really think about what was happening, who was doing what and how everything unfolded. Although, we were not so blind as to not see if something was out of balance with our military, local police and local government officials. According to page 4 as published by the Center for Disease Control (CDC) terrorism does not even make the list of causes of death in the United States of America in 2011, the latest year information is available. Why was every home, ordered by Congress, to be required to have cable or satellite television? Why would this be important and who benefits from this legislation? After the Telecommunications Act of 1996 was passed television went from a free service to a paid service. No longer would television be delivered, for free, to our homes or businesses. We would have to pay for the privilege of having a monitor in our homes. What comes through the cable that enters into our homes? What information is gathered as our television is turned on or even in an idle, off stage? Before last week this question would have come straight from the “Tin-Foil Hat Club”. Not so any more. With the information presented above you should be asking this question. You should be asking why the criminal federal government is spending $85 billion annually to spy on all of us. You should be upset. Please get upset and please begin asking questions. The evidence is no longer coming from the “internet”, it is coming from concerned citizens who have been asking questions for several decades while you have been dreaming of winning the lottery or watching the latest episode of CSI. Please join us in the “Conspiracy Nut Land” known as the internet and begin gathering real information before the government takes it all away.